That's Vegetarian?! : Summer Sangria Time!! It is the end of summer, a heat wave everywhere. Enjoy fruit filled beverages that are light and refreshing. Cut up a peach, grapes, strawberries, nectarines, and some watermelon. Put in a glass with some ice and add water, seltzer, or club soda for something non-alcoholic and refreshing. Or use that fresh fruit and make sangria. 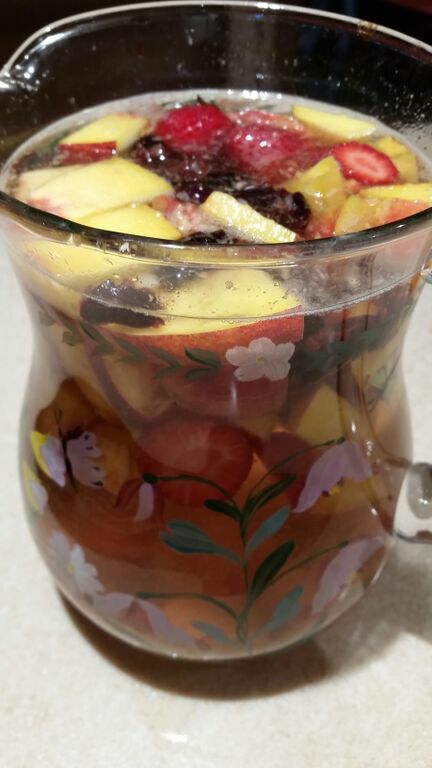 Just add the fruit to a pitcher, pour a bottle of white or blush wine over so the ratio is 1/4 fruit to 3/4 wine and let it set in the fridge for 8 hours. There is no need to soak the fruit in brandy. It adds some flavor but the extra alcohol is not necessary. I prefer a drier white like a Chablis, Sauvignon Blanc or Pinot Grigio. When serving top with a splash or seltzer or club soda. Don't forget to put some of the fruit in the glass too! Quick Meal That Feels Like Dessert!